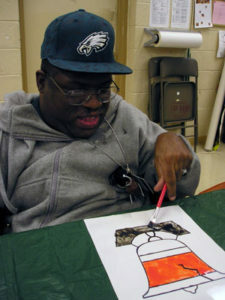 All Blossom Philadelphia Adult Services Programs are designed to include and meet the needs of adults with disabilities and older adults. Blossom Philadelphia 's Adult Day Service programs stress the enhancement/ development of skills in the areas of communication, daily living, interpersonal relationships, creative capabilities, community/cultural awareness, mobility, physical and emotional well-being and all areas of independent functioning. All activities are habilitative in nature. Activities are planned with input from the program participants and are designed to address specific skills as well as individual interests. Day Services are addressed via programming on three levels to best meet the interests and needs of our program participants. Each level is designed to provide for the maximum involvement of program participants requiring varying levels of support and based on their current level of independence. Licensed by DPW 2380 Adult Training Facilities The ADP program is designed to meet the needs of individuals who function best in an environment that provides routine familiar activities that the participant is able to perform independently. Activities are planned with input from the program participants and are designed to address individual needs and interests and to enhance skill acquisition. Participants are given the opportunity to choose either independently or with staff support from a daily schedule of activities. Activities may be modified or adapted equipment may be used to facilitate maximum participation. In addition, assistance with personal care tasks (dressing, feeding, toileting) is provided by staff as needed throughout the program day. The OPTIONS program is designed to meet the needs of individuals who function best in an environment that provides opportunities to practice problem solving skills using trial and error. Activities follow a daily schedule and are planned with input from the program participants. Individuals may choose from the daily activity schedule or opt to pursue specific individual interests, Modifications will be made to facilitate maximum participation when needed. Individuals in this program area are able to advocate for assistance with performing their personal care tasks ( dressing, feeding, toileting.) They are also able to follow a daily routine, adhere to program rules and seek staff assistance when necessary. Licensed by DPW 2380 Adult Training Facilities The ATP program is designed to meet the needs of individuals who function best in an environment that provides routine repetitive activities. Activities are planned to address individual needs and interests and are designed to enhance skill acquisition. Participants are given the opportunity to choose from a daily schedule of activities. Each individual receives assistance and support from staff and through activity modification and adapted equipment to facilitate maximum participation. In addition, assistance with personal care tasks (dressing, feeding, toileting) is provided by staff throughout the program day. 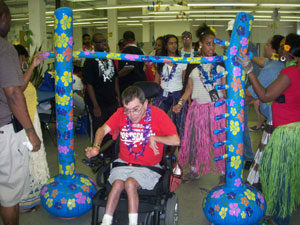 Adult Service program participants receive additional services in order to encourage healthy and independent living. Services may include case management, community integration, medical consultation, personal care assistance and occupational therapies such as evaluation and ongoing consultation, design of adaptive equipment, job and home site modification and assistance with mobility. Information and assistance in areas such as transportation, Social Security, medical benefits, attendant care and housing are also available. or contact Deb Wolf, Director, Adult Services at 215.242.4200 ext 602 or dwolf@blossomphila.org.